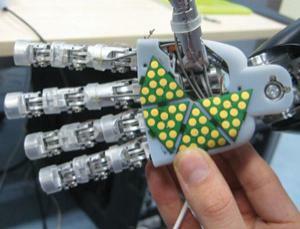 Gimme five and I'll feel it (Image: IIT). BEAUTY may be only skin deep, but for humanoid robots a fleshy covering is about more than mere aesthetics, it could be essential to making them socially acceptable. A touch-sensitive coating could prevent such machines from accidentally injuring anybody within their reach. In May, a team at the Italian Institute of Technology (IIT) in Genoa will dispatch to labs across Europe the first pieces of touch-sensing skin designed for their nascent humanoid robot, the iCub. The skin IIT and its partners have developed contains flexible pressure sensors that aim to put robots in touch with the world.